Due to the impacts of natural processes and anthropogenic activities, different coastal wetlands are faced with variable patterns of heavy metal contamination. It is important to quantify the contributions of pollutant sources, in order to adopt appropriate protection measures for local ecosystems. 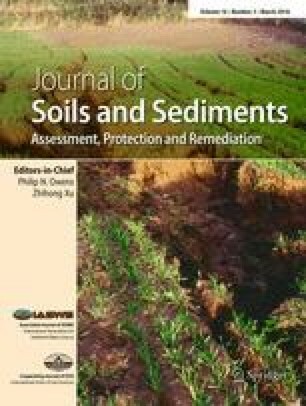 The aim of this research was to compare the heavy metal contamination patterns of two contrasting coastal wetlands in eastern China. In addition, the contributions from various metal sources were identified and quantified, and influencing factors, such as the role of the plant Spartina alterniflora, were evaluated. Sediment samples were taken from two coastal wetlands (plain-type tidal flat at the Rudong (RD) wetland vs embayment-type tidal flat at Luoyuan Bay (LY)) to measure the content of Al, Fe, Co, Cr, Cu, Mn, Mo, Ni, Sr, Zn, Pb, Cd, and As. Inductively coupled plasma atomic emission spectrometry, flame atomic absorption spectrometry, and atomic fluorescence spectrometry methods were used for metal detection. Meanwhile, the enrichment factor and geoaccumulation index were applied to assess the pollution level. Principle component analysis and receptor modeling were used to quantify the sources of heavy metals. Marked differences in metal distribution patterns between the two systems were present. Metal contents in LY were higher than those in RD, except for Sr and Mo. The growth status of S. alterniflora influenced metal accumulations in RD, i.e., heavy metals were more easily adsorbed in the sediment in the following sequence: Cu > Cd > Zn > Cr > Al > Pb ≥ Ni ≥ Co > Fe > Sr ≥ Mn > As > Mo as a result of the presence and size of the vegetation. However, this phenomenon was not observed in LY. A higher potential ecological risk was associated with LY, compared with RD, except for Mo. Based on a receptor model output, sedimentary heavy metal contents at RD were jointly influenced by natural sedimentary processes and anthropogenic activities, whereas they were dominated by anthropogenic activities at LY. A combination of geochemical analysis and modeling approaches was used to quantify the different types of natural and anthropogenic contributions to heavy metal contamination, which is useful for pollution assessments. The application of this approach reveals that natural and anthropogenic processes have different influences on the delivery and retention of metals at the two contrasting coastal wetlands. In addition, the presence and size of S. alterniflora can influence the level of metal contamination in sedimentary environments. This research was supported by the Ministry of Science and Technology of China (2013CB956504) and the National Natural Science Foundation of China (40906066). J. Ingels was supported by a Plymouth Marine Laboratory (PML) Postdoctoral Fellowship and a Marie Curie Intra-European Fellowship within the 7th European Community Framework Programme (Grant Agreement FP7-PEOPLE-2011-IEF No 300879). We gratefully acknowledge Drs. Charles Nittrouer and Andrea Ogston, and anonymous reviewers, for their constructive comments on the original manuscript. Thanks are also due to Longhui Zhang and Deli Wu for their assistance in field sample collection and some previous work in laboratory.